GIGABYTE Unveils on its facebook page the Market’s Only Passive Radeon HD5770 GV-R577SL-1GD Graphics Card. 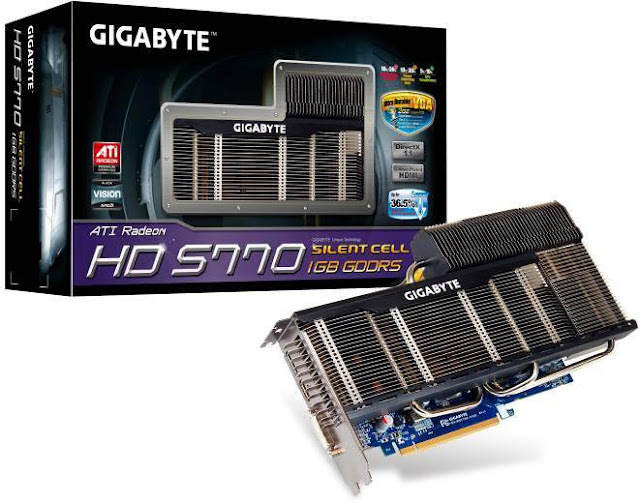 The GIGABYTE GV-R577SL-1GD features GIGABYTE’s own Ultra Durable VGA Technology, which can provide outstanding overclocking capability, lower GPU temperature, and excellent power efficiency. GIGABYTE’s unique technology Ultra Durable VGA features 2 oz copper PCB board, Samsung and Hynix memory, Japanese solid capacitor, Ferrite /Metal Core Chokes, and Low RDS (on) MOSFET. Compared with traditional graphics accelerators, Ultra Durable VGA graphics accelerators can lower GPU temperature by 5%~10%, decrease power switching loss by 10%~30%, and increase overclocking capability by 10%~30%. GIGABYTE Ultra Durable VGA graphics accelerator GV-R577SL-1GD can provide truly “high-performance” and “green” graphic card solutions.